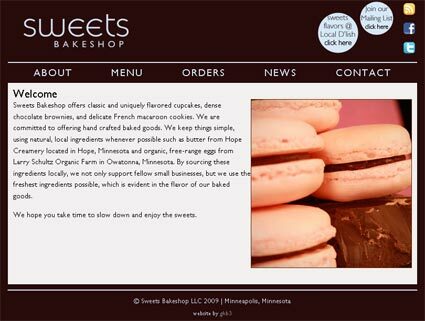 Sweets Bakeshop is a fledgling Cupcakery in the Twin Cities area. In addition to a variety of unique Cupcake flavors, they also sell French Macaroons and Brownies. Currently selling at local farmers' markets and taking custom orders, they hope to open a retail store and bakery Fall 2009.